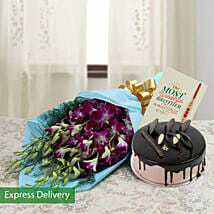 "i love ferns and petals"
"Thanks for delivery on time"
Send Rakhi to Gurgaon and Make Your Brother Happy! 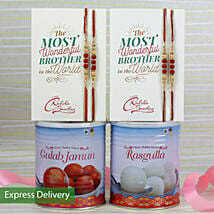 Raksha Bandhan is a time to celebrate the beautiful bond between brother and sister. It is a reminder of the love and strong connection we share with our siblings. Include us in this auspicious celebration by availing the opportunity to choose and send rakhi to Gurgaon to your brother. Pair it with exciting gifts and send your love to them! Are you far away and won’t be able to tie rakhi to your brother this time? Do not worry! 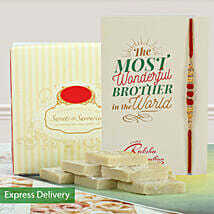 You can take our help and send a dazzling rakhi to your brother through our online portal. Our team does online rakhi delivery in Gurgaon and other areas. Not only this, if you want to give your brother a midnight surprise, we are all ears! We provide the awesome facility of midnight delivery as well. So now, when the clock strikes twelves, our minions would be at your brother’s doorstep to wish him a happy Raksha bandhan from your side. We understand how much you want to express your love to you brother! Our online portal is the one- stop solution to all your worries about this Raksha Bandhan 2019 and will help you celebrate it in better spirits than the last time. We have an unmatched range of high-quality rakhis that have been delicately crafted by experienced hands in various intricate designs and wonderful colors. 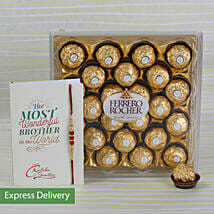 You can send rakhi online to Gurgaon and express your infinite sibling love to your brother. 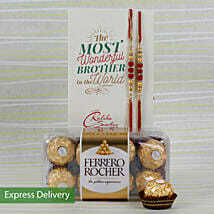 Not only rakhis, we can ramp up your rakhi with a gift to your brother to make him feel elated. We have a variety of rakhi sets if you want to send more than one rakhi. Show Sibling Love and Send Rakhi Online to Gurgaon! You may have fought with your brother a million times but we know how much you love him. No matter what, when it comes to your brother, your heart turns as soft as a marshmallow. We know that you share your laughter and wipe his tears. Express this awesome love and send rakhi to Gurgaon, India to your brother. He would be waiting for this Raksha bandhan for your rakhi. 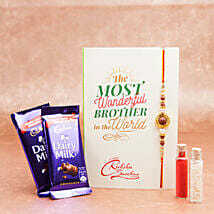 If you love him, send an exclusive and maybe personalized rakhi for brother and put an end to his long wait. We also provide mid-night delivery. 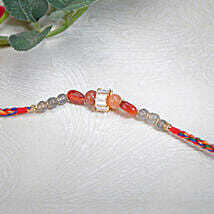 Tying the sacred thread of love is the center of every Rakhi. Those beautiful threads of care and trust symbolize how strong the bond between siblings is. Rakhi is an occasion to remind the siblings of all the beautiful memories cherished together. 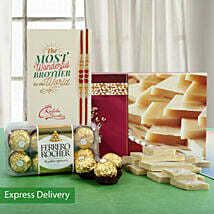 If you're living too far away from your siblings, we get you the best online Rakhi delivery with free shipping. We provide you with everything from Rakhis in floral patterns with colourful artificial flowers embedded in them to cartoon Rakhis. You can send Rakhi sweets to Gurgaon along with our extremely attractive Rakhis with cartoon characters like Tom and Jerry/Popeye/Goofy for infants, to sandalwood Rakhis with their authentic look and aromatic character. We also have a slightly expensive range of precious stones Rakhi with beautiful stones affixed on them. The stones used add glitter to the Rakhi. These are available with beautiful combos, making your Rakhi gifts to Gurgaon even more special. We have professional artisans crafting such beautiful Rakhis for you along with a team of experts who design your Rakhi boxes to make it ever so special. Get in touch with us today for the most beautiful Rakhis and gift combinations.